If you’re always hitting the road because you have business to do out of town then you’ll understand the struggle of keeping your clothes crisp and neat. It’s not only our car seats that wrinkle the backs of our shirts, but the car itself does not have any specific clothing-holding compartment to prevent creases on our newly ironed shirts and pants. Garments bags can only do so much in preserving neatness, but most of the times the fate of our clothes are at the mercy of bumpy roads and humid car air. 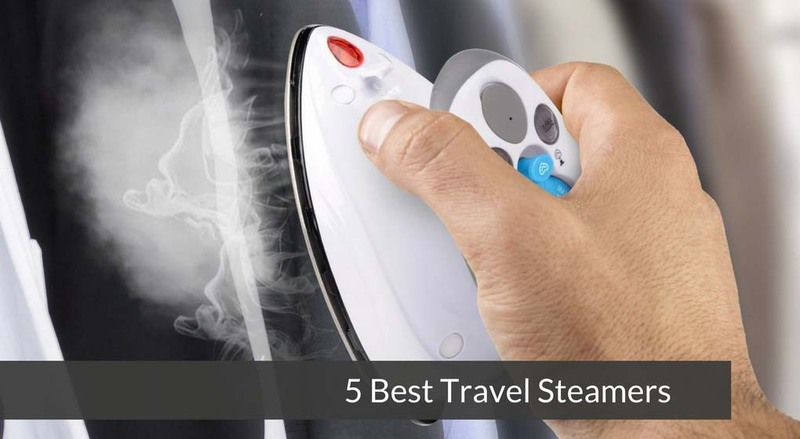 These are the reasons why traveling with a portable steamer is essential for travelers. If you’re anything like you, you’ll appreciate that steamers are a great alternative to ironing and do quick work in working out folds and creases. With a compact steamer in your travel bag or car, you can refresh your crumple-up clothing before business meetings. Whether you’re on the hunt for a compact unit to stash in your bag or one that comes with an assortment of attachments for versatility, there’s a steamer out there for you. Let’s take a look at 5 of the best steamers you can buy right now. 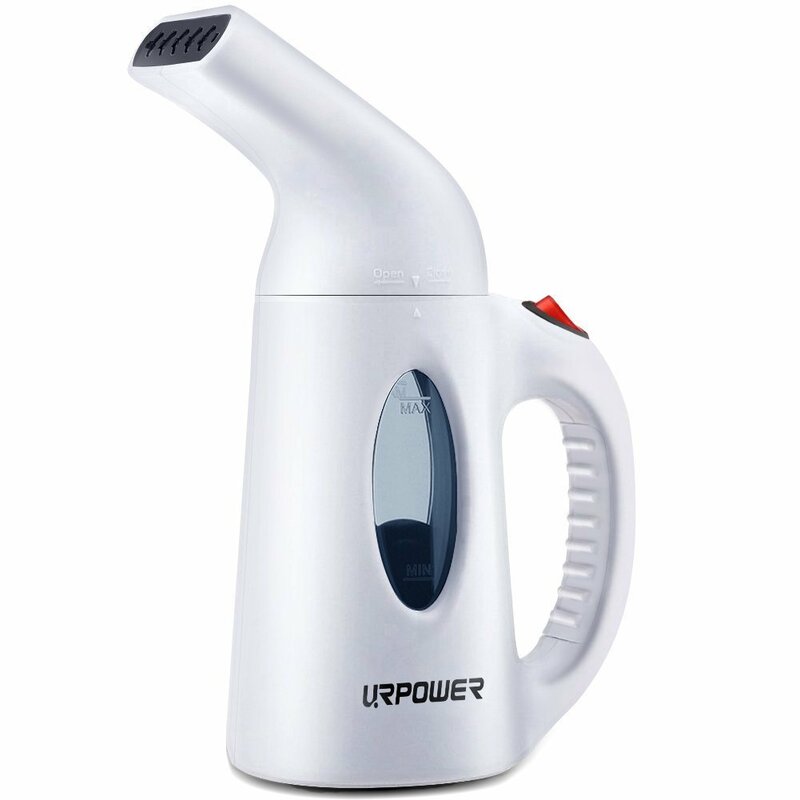 When it comes to portable travel steamers, you can’t go wrong with the URPOWER Garment Steamer. This is a compact unit that is consistently given high ratings by its customers. This steamer will soon become an item to always take with you when you travel, whether you’re leaving town for business or pleasure. The URPOWER Garment Steamer is small enough to fit into your suitcase (its dimensions are smaller than those of an iPad) and you need to do to operate this steamer is fill it with water and plug that baby into an electric outlet. It takes less than two minutes for the steamer to sufficiently heat up the water, and then it emits a powerful flow of steam that can be used on any fabric you use. You should get between 7 and 10 minutes of continuous use out of this unit before needing to refill the tank. Better yet, this product has an automatic shut-off feature for when it starts to overheat or when there’s no more water. 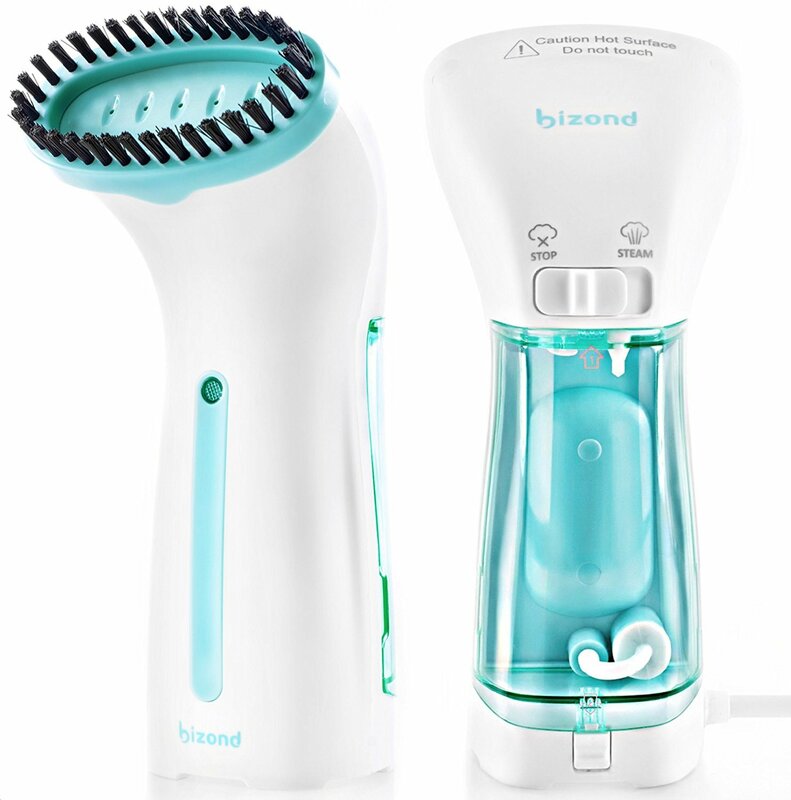 Customers have complimented this URPOWER steamer for its heavy-duty power in smoothing out even the most stubborn wrinkles, and compact and lightweight build. If you’re looking for a truly compact steamer that can fit in the palm of your hand but does miraculous work at smoothing crinkled clothes, then you can’t go wrong with the PurSteam Steam Iron. 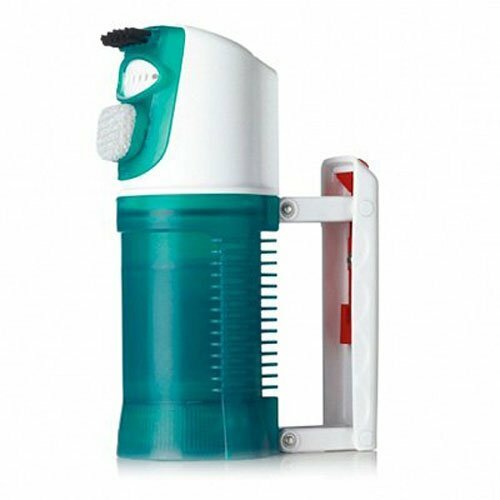 This travel steamer is a 2-in-1 product which both steams and irons your clothes to give you a crisp look every time. This portable travel iron by PurSteam can be easily stored into your suitcase for whenever you need a quick touch-up when you hit the open road. It creates 30 percent more steam than comparable steamers on the market, and it comes with dual-voltage so it can be used in international countries. The steamer’s controls for adjusting its settings are conveniently placed on its anti-slip handle so you can produce just the right amount of heat and steam for any job at the touch of a button. This product has been praised for being a perfect travel buddy. It’s small enough to put in a suitcase or backpack, its anti-leak cap keeps all water droplets in, and it takes no time to properly heat up the water to create steam. All in all, you’ll definitely find this heavy-duty little steam iron to be an invaluable unit to take with you at all times. Several travel steamers are made to only steam clothes while others have dual functions to including iron capability. This steam by Travel Smart takes things to another level with its detachable bristles and brushes for removing lint while they work to eliminate wrinkles. The Travel Smart Garment Steamer is the perfect tool to take with you. It can even be used in other countries thanks to its dual-voltage system. It features a detachable water tank that you fill up, and it holds enough water to keep the unit running for 10 minutes. It comes with two brush attachments for removing balls of lint from your clothing as well. This garment steamer is praised by its users for being a portable and versatile unit for keeping your shirts and pants looking neat. If there ever was a complaint about handheld travel steamers, it’s that you need to keep the unit upright to prevent spilling water all over the clothes you’re steaming. The BIZOND Mini Clothing Steamer has fixed this problem while still maintaining perfect steam iron functionality. It was designed specifically to prevent leakage while being held horizontally or even upside down. The BIZOND Clothing Steamer is compact, a feature that is essential for taking with you on trips. It effectively heats up water in less than 30 seconds, and the electronic pump mechanism prevents the spout from gurgling water. It even features a water purifying system that extends the life of this steamer, even if you put tap water instead of distilled water. Don’t be tricked by its compact size; you can get up to 10 minutes of steam for every tank of water. If you’re in the market for a steamer with looks to match its functionality, then this joy Mangano hand steamer is the way to go. This item has a chic design and comes in a wide selection of colors. It also one of the highest-rated steamers out there that works miracles against crinkles and wrinkles. 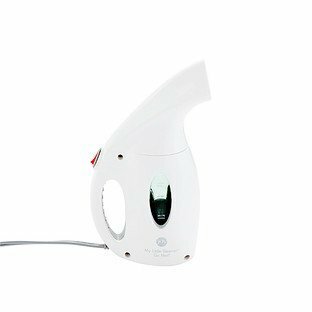 This is a lightweight, handheld steamer that quickly eliminates wrinkles and creases on every kind of fabric. This unit comes with a water-level window which shows how much water is left inside of the tank, and it has an automatic shut-off feature to prevent overheating. 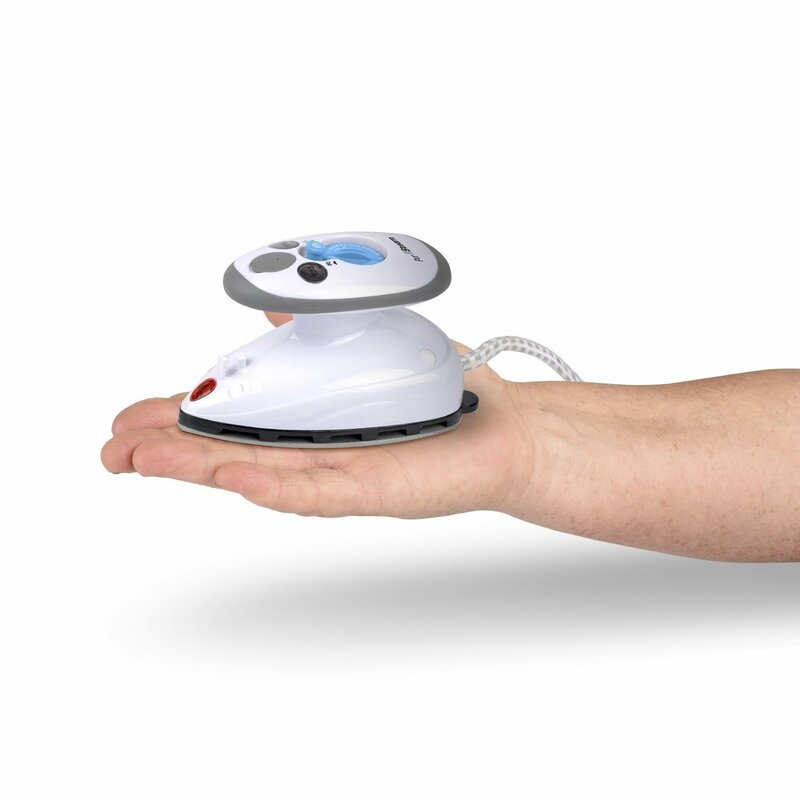 Customers have noted that this Joy Mangano Steamer takes less than 60 seconds to heat and its size allows it to fit comfortably into a suitcase. Another popular feature is that it can use tap water so you don’t have to go to fancy stores to get that fancy distilled water made for kings and queens.